New stripe top and I'm so obsessed with it. I can't get enough of stripes. Wearing it with a denim jacket and ripped jeans are my go to look this spring. Some of you commented on my Instagram and Facebook page that this pair of sandals looks really high and that you may not have the confidence to walk in them. This made me want to share some tips on how to wear high heels. When I'm shopping online, I always look at the description of the shoes before I order. Lots of online retailers have information like true to size or fit smaller in the product detail. You need to find the right size for you. I'm currently using this Julep Doublesteps foot treatment and friction stick. I put it on my feet on the areas where I easily get blisters before I put on my heels. This shea butter treatment is infused with vitamin E and chili pepper oil to stimulate circulation. It also creates a barrier between your feet and shoes to reduce friction and stomp out blisters. -Try insoles or foot cushions. These gels and silicon are really soft for your feet. They help shift the weight and alleviate heel pain. Some heels are really high and tough to walk too long in, but they are so pretty. If you know you will be in these types of heels for long hours, you can always bring foldable flats with you. I have a few pairs of Yosi Smara ones, they are tiny after folding and fit in small bags. -Be good to our feet. At the end of the day, after showering, I always put on lotions and creams and that includes putting them on my feet. Massage them for a while as it's good for your feet. This shea butter foot cream is really good. Or get a foot massage and a bubble bath, which are great for our feet. OHhh my goodness I LOVE this! Those shoes are SO incredible! I'm loving this look, especially the jeans, bag and heels! I looove the stripes trend this year... that top is great! And so is that bracelet!! I agree platforms are great and take off some of the pressure! Love these spring stripes! I could never handle these heels, but you look incredible! I usually bring flats with me whenever I wear heels. If it's not in the car, I use big tote bag to house it. I love how you styled this outfit with your striped tee. Pretty! oh my god i love it all. your rings, your bag, your shoes. amazing! Super cute outfit I love the look! I also love the tips you shared! So helpful! Wow. 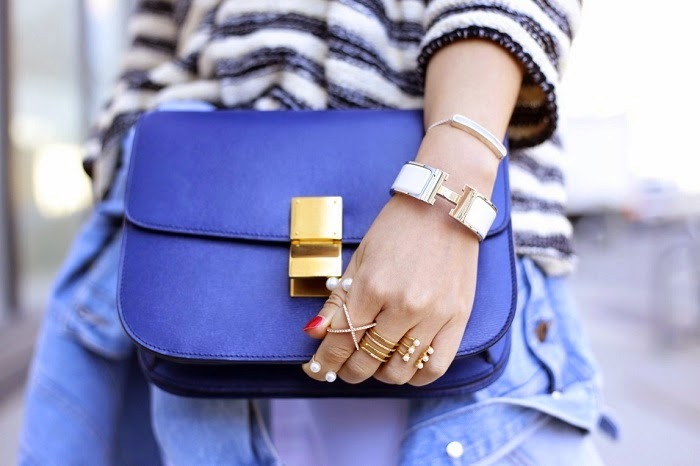 I am completely IN LOVE with your accessories! Perfect rings! I love your top and those shoes - just perfect! Hi there, What a great look, I love those jeans and the colorful bag! Great styling! !have a lovely weekend. Ring game is on point! You look great! Love your shoes and bag! These are some great tips to make heels more comfortable. Also, I'm loving those shoes! !